Five years since Hurricane Katrina, New Orleans remains a city that needs rebuilding with added challenges from the recent oil spill in the Gulf. Looking to lend a hand while in New Orleans? Marriott has announced a new voluntourism program called “Spirit To Serve New Orleans“ that makes helping out easy for both business and leisure travelers. Beginning August 3rd, guests who book the voluntourism package can partner with New Orleans Area Habitat for Humanity or Second Harvest Food Bank of Greater New Orleans, through the end of the year, to help rebuild homes hardest hit by Hurricane Katrina and provide food to families impacted by the Gulf oil spill. 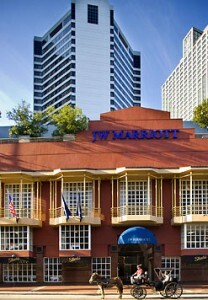 The participating hotels include New Orleans Marriott; JW Marriott New Orleans; New Orleans Marriott at the Convention Center; Renaissance New Orleans Pere Marquette Hotel; Renaissance New Orleans Arts; Courtyard New Orleans Downtown near the French Quarter; Courtyard New Orleans Convention Center; SpringHill Suites New Orleans Convention Center; and Residence Inn New Orleans Convention Center. Rates start at $99. To book the Spirit to Serve New Orleans package, visit www.spirittoserveneworleans.com or call 1-888-236-2427. Enter V5S in the box entitled “corporate/promotional code” for online bookings.